Isn’t the summer just flying by? Geez, it’s almost July already, and it feels like it was just May yesterday! Next week, it will be the Fourth of July already! I just can’t quite believe it myself. But the holiday weekend is coming soon, and my cookie friend SweetSugarBelle had a great idea! 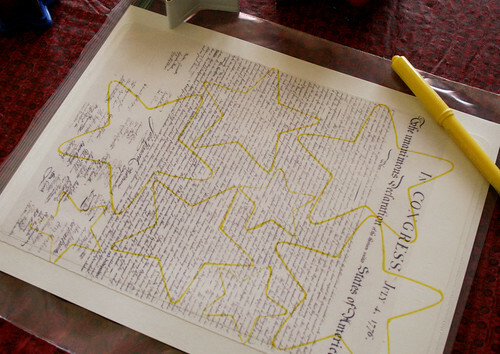 To make sure that you don’t show up at a fireworks party with the “same ol’, same ol’” stuff, she asked a bunch of us cookie/foodie bloggers to come up with fun & funky new ideas for the 4th. 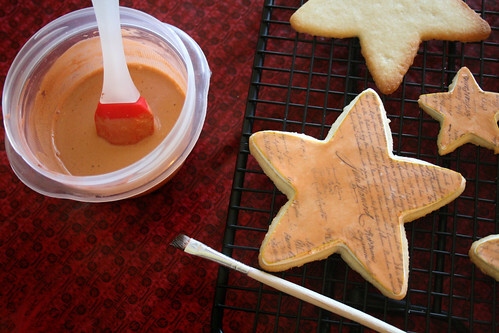 There was a twist, of course: we had to use a plain old star cookie cutter. I put on my top hat & got to thinking, excited to toss my vote in such a neat collaboration. Want a peek at my creation?! 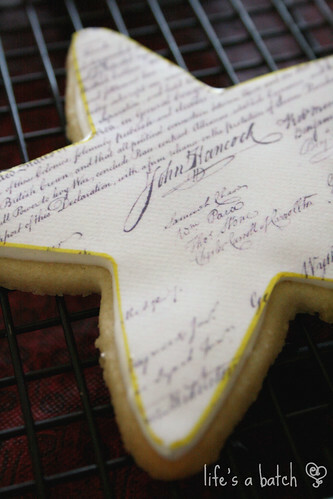 Gimme-Your-John-Hancock Star Cookies. Here they are, in all their glory! This was my first experience with edible icing sheets. (See? That’s how easy these cookies are!) I’d never worked with the stuff before, nor do I own a special icing-only printer or any fancy equipment. Instead, I found a local grocery store that would sell me the sheets if I just brought them an image. They were about $7/each, so it’s not something I’ll do terribly often, but once in a while makes a fun alternative for decorating. The edible icing sheets dry out rather quickly, so keep them in a gallon-size ziploc bag until you’re ready to use them. (I actually took the gallon bags with me to the store to pick them up, too.) I had two edible sheets, and I only worked with one at a time, even. 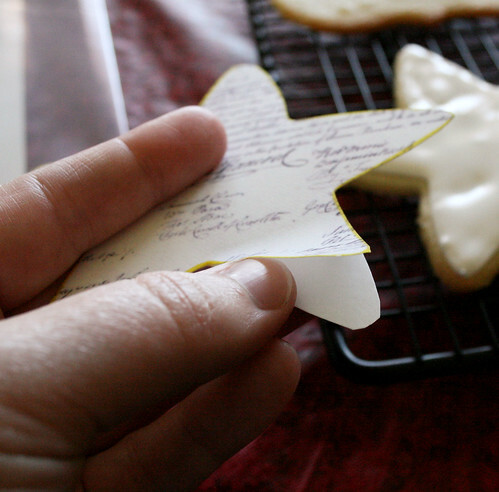 Using a yellow food color marker, trace the same cookie cutters you used to make your cookies. You can make all the same size, but I thought it might be fun to throw in a few different ones. 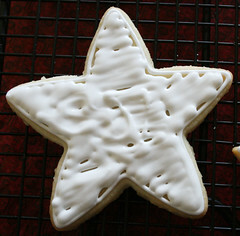 Having the small star cookies also helped to really maximize the amount of icing sheet I could use, too. Tip: It’s all about the John Hancock, folks. That’s what people know & recognize, so make sure you get that signature dead-center in at least one of your cookies! Now, imagine there’s a picture of me cutting apart the stars on the icing sheets. (DO NOT remove the backing yet, by the way!) I meant to take a picture, but then I forgot. But you know what scissors look like, right? Right. Work with 2 or 3 cut-outs at a time, and put the rest back into the bag so it doesn’t dry too quickly. Leave the 2-3 on top of the bag while you work the next step. 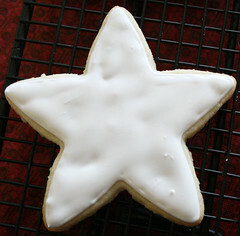 Using 20-second icing in white, outline 2-3 stars at a time. Carefully, peel the backing from the icing sheet with your fingertips. (Paint your nails a nice patriotic color first, too.) The icing sheet shouldn’t be sticky, but you don’t want it to be brittle, either. If you stick to doing 2-3 cookies at a time, I promise it will be perfect. When the cookies are COMPLETELY DRY, proceed with “aging” the cookie. Using small amounts of water at a time, dilute the brown icing until it is pretty thin. Can you see the bubbles in that cup? That happens to me when I make super-thin, runny icing, and that’s what you need for this part. 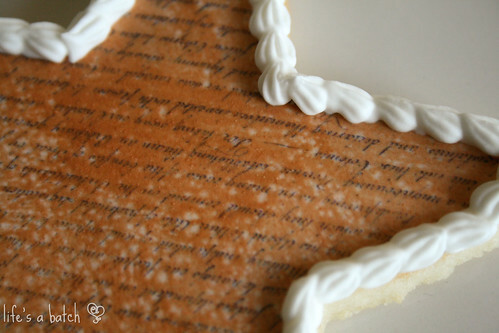 If your icing is too thick, it will coat the cookie, and you won’t be able to see the print underneath the icing. Using a small, flat-tipped food brush, paint on a very thin layer of brown icing. You can dab on extra in different spots to give a true mottled look to the print. Let this step dry for an hour. Using white piping icing fitted with a 16 tip, pipe a pretty border on the dried star cookies. if you’re unfamiliar with different decorating tips, practice for a bit first. I outlined a star cutter on a napkin & went to town practicing for a while. 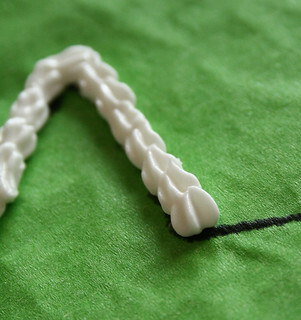 For this look, apply a short squeeze of pressure, and then pull the tip straight out – away from the “bulb” of icing. Next, lower the tip onto the pointy bit that lingered in the air, and then push that down to begin the next bulb of icing. 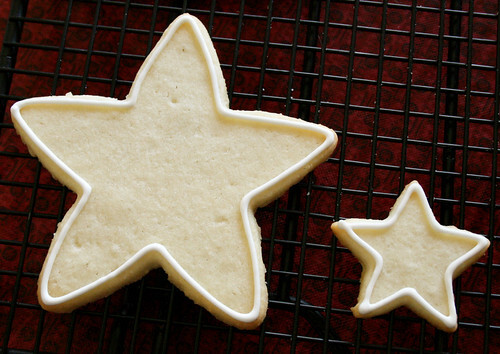 And then just use that same process on your star cookies for a pretty, sweet finish. In my defense, that cursive script was really, really tiny, so let’s blame it on that (and not my lack of attention). 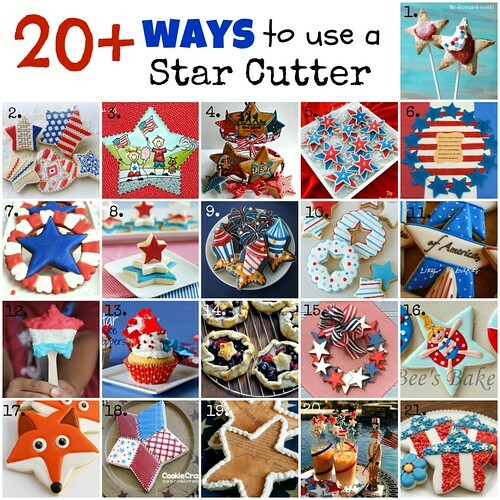 But the VERY BEST part of this whole experience is seeing all the NEATO creations my fellow bloggy friends came up with their star cutters! Serious biz, prepare to be blown away by their creativity! 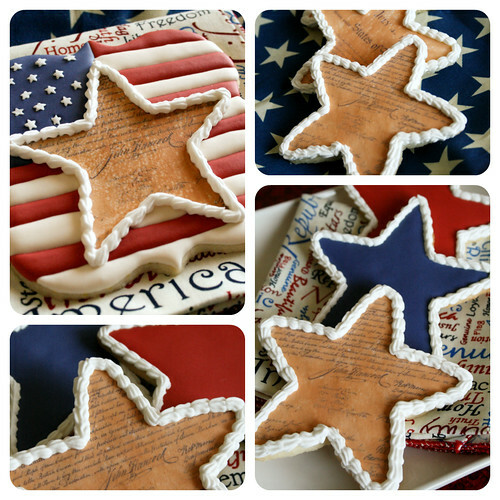 And, make no mistake, you WILL find something here that you want to make this year for your Fourth of July festivities! AWESOME as usual. These are absolutely fantastic!! Well, since I couldn’t say awesome too, how about a flashy synonym or several: astonishing, awe-inspiring, beautiful, breathtaking, grand, impressive, magnificent, majestic, mind-blowing*, moving, something else, striking, stunning, wonderful and wondrous. Thanks, Erica! That made me LOL. 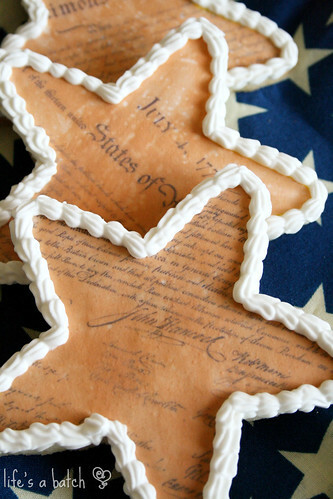 The flag cookie with the star in the middle makes me want to stand and say The Pledge of Allegiance! Totally incredible cookie!! I have never used edible icing sheets but, these are so perfect, I have to give them a try!! Thank you, Lisa! I was really happy with how it turned out, even if the lines are perfectly straight & all that jazz. Thanks for popping over! When I saw your tweet of this cookie *It is working* I couldn’t wait to see your finished post and how you made them. 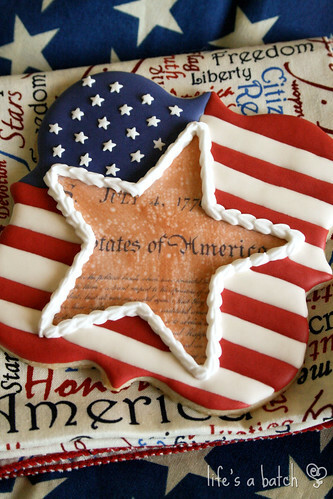 These are beautiful and the one on top of that wonderful flag cookie is my favourite. Makes me wish that I had an icing printer. Fabulous work Nicole! Have a wonderful July 4th celebration. Thank you, Paula! The flag cookies are my favorite as well, even if they were just “play” cookies, haha. But I can tell you that while an icing printer might be nice, I know I wouldn’t use it often enough to keep the $$ ink from drying out. See if any of your local grocers will make you the sheets instead. Walmart made these for me! Thanks, Pam! It was so fun to think of a unique way to use the cutter – I love challenges like this! The only part that made me sad was not having even MORE cookies I could’ve decorated, haha! SUCH a clever idea, love it!! I’ve got to go to my supermarket and see if they do this too . Thanks, Meaghan! I was able to get my icing sheets from our local Walmart. I figure if I can find them here in Minot, ANYone can find ‘em! love, love, love, love, love these!!! I think you were smart to have them printed at a store instead of buying a printer. I think they’re more trouble to maintain than they are worth. Your cookies are making want to break mine back out, though. Thanks, Bridget! I went that route for two reasons, really. 1) I was late to the project, so I only had 4 days’ time (not enough to procure an icing-only printer), and 2) I’m pretty sure I won’t use it often enough to justify the more $$ ink. I’m realistic, ya know? LOL. But for the crazy EASE of decorating these, I think they were worth spending $14 on icing sheets. With the red & blue filler stars, I had about 3 dozen cookies total! Wow, wow, wow! Sooo beautiful and classic! I love them! Thank you, thank you, Marian! Elegant & easy – oh, how I wish all cookies could be quite this way! These are so beatiful!! Very classy, and just perfectly done! Thank you, Glory! I really enjoyed trying something new with these cookies! these left me speechless on the FB and now that I’ve seen the whole process I’m once again lost for words. What a cool Cookie! Thanks, Hani! Now you know the secret – how really very easy they are to make! I was soooooo worried about using the icing sheets. I’d read all kinds of stuff about them drying out so quickly & such. They were a BREEZE to work with, whew! Thank you so much, Nadia! I love these Nicole. Did you cut a star out of the plaque cookie or did you place a cookie on top? It looks like you cut it out – I really cannot tell – either way it looks fabulous and I am in love with it!!!! Thanks, Lorraine! I used the star cutter to “mark” on the plaque before baking, and then I proceeded from there. I then added the white & icing sheet and let that dry overnight, before decorating the stripes & border around it the next day. YOu just blew my mind! Aging the cookie?! But shame on you for forgetting the patriotic nail polish! LOL, next time I’ll be sure to get a mani first! Pingback: Fox Face Cookie..Your a Star! These are amazing! You are one talented baker. I hope you’ll add these to my Patriotic Project Parade. I would love to see them there. Thanks for thinking of me! I linked up just now, and I’m blown away by all the awesome crafts in your party! Wow!